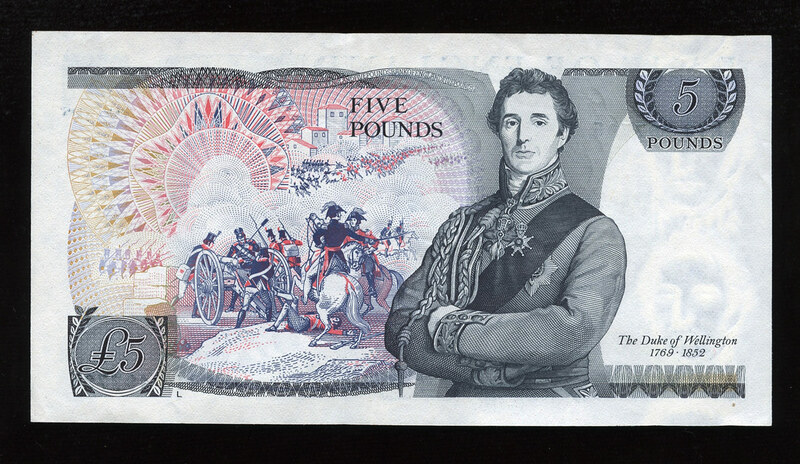 British bank notes 5 Pounds Sterling banknote, issued by the Bank of England. Obverse: Portrait of Queen Elizabeth II. The Queen is depicted in state robes, wearing the George IV State Diadem, Queen Victoria’s Golden Jubilee necklace and Queen Alexandra’s Cluster Earrings. Bank of England logo: Britannia seated next to a pile of coins and a shield, holding a spear and a laurel or olive branch. Nike, also known as Victoria, winged goddess of victory riding a chariot pulled by two horses. 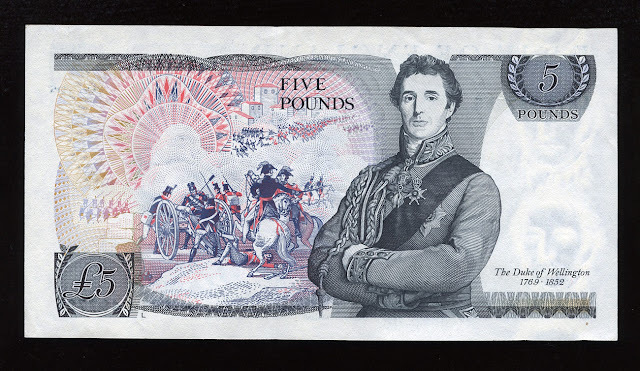 Reverse: Portrait of Field Marshal Arthur Wellesley, 1st Duke of Wellington (1 May 1769 – 14 September 1852), was a British soldier and statesman, a native of Ireland from the Anglo-Irish Ascendancy, and one of the leading military and political figures of the 19th century. Scene during the famous Battle of Salamanca. The Battle of Salamanca saw the Anglo-Portuguese army under the Duke of Wellington defeat Marshal Auguste Marmont's French forces among the hills around Arapiles south of Salamanca, Spain on 22 July 1812 during the Peninsular War. Watermark: Vertically repeated effigy of The Duke of Wellington. Signature: D.H.F. 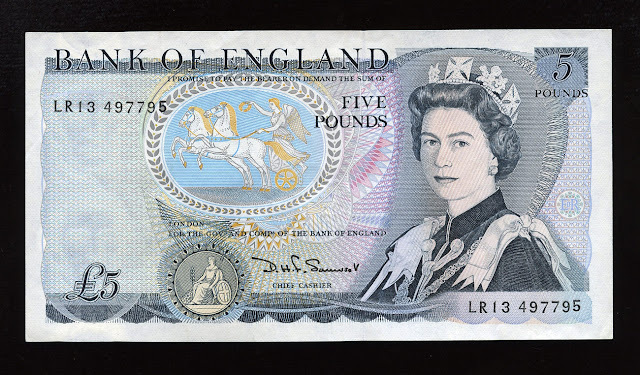 Somerset - Chief Cashier. Date first issued: 11 November 1971. Date last issued: 1990. Date ceased to be legal tender: 29 November 1991. Field Marshal Arthur Wellesley, 1st Duke of Wellington, KG GCB GCH PC FRS (1 May 1769 – 14 September 1852), was a British soldier and statesman, a native of Ireland from the Anglo-Irish Ascendancy, and one of the leading military and political figures of the 19th century. His importance in national history is such that he is often referred to as "the Duke of Wellington" instead of "the 1st Duke of Wellington" (overshadowing the heirs to his dukedom including the current duke — see Dukes of Wellington). Wellesley rose to prominence as a general during the Peninsular campaign of the Napoleonic Wars, and was promoted to the rank of field marshal after leading the allied forces to victory against the French at the Battle of Vitoria in 1813. Following Napoleon's exile in 1814, he served as the ambassador to France and was granted a dukedom. During the Hundred Days in 1815, he commanded the allied army which, together with a Prussian army under Blücher, defeated Napoleon at the Battle of Waterloo. Wellesley's battle record is exemplary, ultimately participating in some 60 battles during the course of his military career. Wellesley is famous for his adaptive defensive style of warfare, and extensive planning before battles, which allowed him to choose the battlefield and force his enemy to come to him, resulting in several victories against a numerically superior force whilst minimising his own losses. He is regarded as one of the greatest defensive commanders of all time, and many of his tactics and battle plans are still studied in military academies around the world.